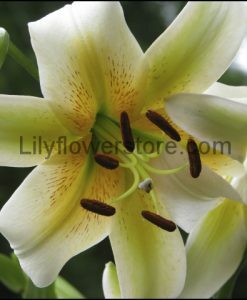 Fragrant Trumpet Lilies: Oriental trumpet lilies are incredibly fragrant, tall. And wonderful for cutting for bouquets. However, often need staking. Subsequently, a well-grown stalk can have over 15 huge flowers. This group includes hybrids of many Asiatic species. The flowers are trumpet shaped, facing outward, and somewhat downward. Trumpet lily flowers fragrance last even into the night!